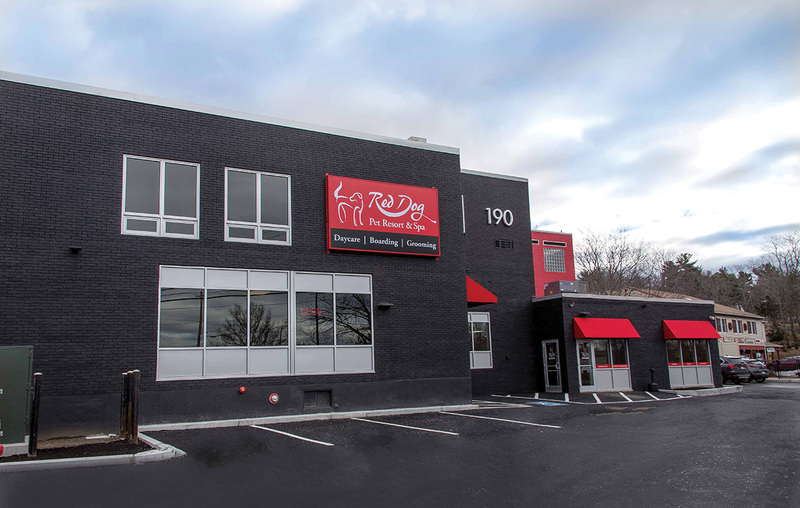 Saugus, MA Tails are wagging across the North Shore, with the opening of Red Dog Pet Resort & Spa, a premier, full-service pet care company. Vantage Builders, Inc., a general contracting and construction firm based in Waltham, Mass., completed the build-out of the two-story, 15,500 s/f location at 190 Walnut St.
Cincinnati, Ohio-based Red Dog provides a range of services to dogs and cats, including daycare, grooming, training, and overnight accommodations. The North Shore location is the company’s second in Mass. The build-out required significant work to the vacant warehouse building. Vantage Builders performed a re-stack of the building, beginning with a complete demolition of the interior. The firm added a second floor, with a new elevator and pit, as well as a staircase. Vantage followed designs from Pendleton Sears Architects, who have worked on other Red Dog locations. The North Shore site has kennels and grooming areas for both dogs and cats. Outdoor dog runs and activity areas inside ensure that Red Dog’s clients have plenty of daily exercise. Building systems work was critical to the project. The air at Red Dog is completely replaced every ten minutes via an air circulation system, reducing the chances of bacteria, germs or odors in the resort. Vantage also installed new plumbing, a sump pump, HVAC and a fire alarm system. All surfaces feature easy to clean finishes, as Red Dog resorts are cleaned with veterinary grade cleaners several times a day.